I have been wanting to create a T Shirt Tote for some time now, but as it happens, life gets in the way. I have a wonderful, thrifted shirt that my son gave me that is destined to become a knitting bag. But it took a request from a Twitter friend and amazing artist to get me moving. Vicki, from Orion Designs had some shirts with beautiful, hand-painted designs that someone created for her. The shirts were ready for repurposing, so she asked me to “do my magic.” I love when someone trusts me enough to say that! We discussed various options and I developed two ideas for two different bags. I’ll share today’s bag and also a tutorial. I knew that I wanted to base the design on my T Shirt Pillow. You can take a look at that tutorial – the beginning steps are all identical. I love the simple frame that the fabric adds to the T Shirt design. 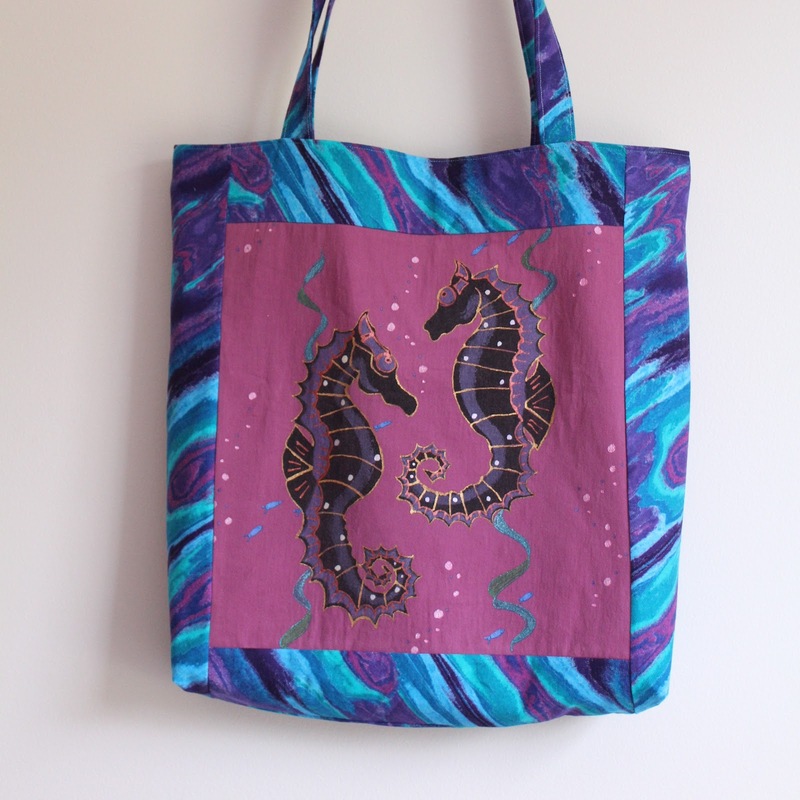 In this case, I wanted a batik or something that evoked the feeling of water since the paintings are of fish and seahorses. I also wanted to add some strength and body to the tote, and selected a coordinating duck cloth for the inside. I have been using duck cloth quite a bit this past year. I love the many, vivid colors available. I also love that it can be washed. 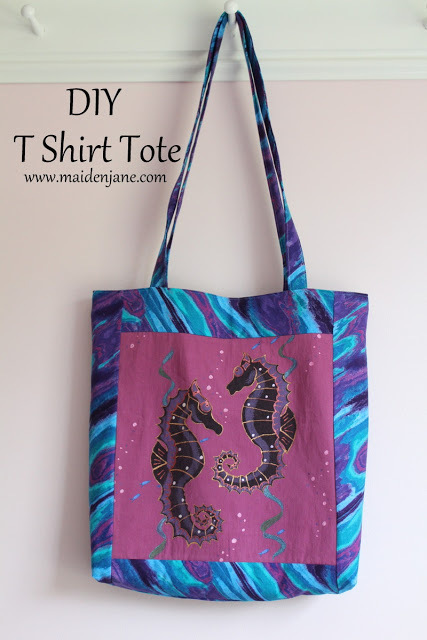 So if you have a favorite shirt that you don’t fit into anymore and can’t part with, try a tote! Maybe your husband just can’t give away his favorite sports jersey – turn it into a “manly” tote that he would be proud to carry! Use a t-shirt front and back or two separate t-shirts. The border fabric can be a contrast or coordinating fabric. I have used polka-dots, tie-dye, and anything that does not have a major, directional pattern. 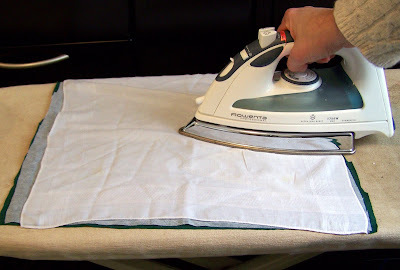 Prewash the t-shirts and border fabric to preshrink them, especially if they are brand new. You can also prewash the duck cloth. If you really want to be careful about shrinkage, I’d recommend washing and drying the duck cloth twice. It isn’t necessary to use an interfacing specifically designed for knits. The interfacing is added for stability and ease of sewing. 1. Cut squares: When cutting the t-shirt into a square, I use an Omnigrid that has been custom cut to a 13 ¼” square template. You can make a clear vinyl template cut to this size or simply measure and mark a square. 3. Apply interfacing: Cut the interfacing to fit just inside the back of the T Shirt. Apply the interfacing per the manufacturer’s instructions to the back side of the t-shirt. 4. Assemble and Sew Two Sides: Pin the shorter border pieces to the top and bottom of the t-shirt. 5. Sew the Front to the Back: Pin the two squares together and sew, using a ¼” seam allowance, along the sides and bottom, leaving the top open. 7. Create Boxed Bottom: With the bottom of the bag facing you, take one corner and pull apart so that a triangle is formed and the side seam and bottom seam line up. Even out the triangle and use a ruler to find the point where it is 3″ across. Draw a line at this point. Stitch along the line. Stitch again 1/4 from the first line of stitching. Cut off the triangle. This creates a boxed bottom for the bag. Repeat with the other bottom corner. 8. Cut the lining: Fold the duck cloth so that the top fabric is at 19″ Cut the fabric, with the fold along the bottom, so that the folded piece is 18.5″ wide and 18″ high. 9. Sew the sides of the lining leaving a 5-6″ opening along one side. 10. Sew boxed bottom in the same way you did for the outside of the bag. Cut two lengths of duck cloth, each 2″ x 36″. Cut two lengths of cotton fabric, each 3.5″ x 36″. Fold the duck cloth in half and press. This will become the inside of the strap. Place the duck cloth on top of the cotton fabric. Warp the fabric around the duck cloth and tuck the last bit under so that the fold runs along one edge. Edge stitch along each side of the handle. 12. Pin the straps to the outside of the bag, 4″ from each side. 13. Place the tote inside the lining, right sides together and pin around the top. 14. Stitch around the top using a 1/2″ seam allowance. 15. Pull the bag through the opening in the lining so that the right sides are out. 16. Edge stitch the opening closed. 17. Turn the lining inside the outside of the tote and press. Top stitch along the upper edge and final press the bag, using a press cloth if necessary. What a gorgeous bag you got out of it! A really lovely idea. I love love love your bags! What a great tutorial, I just might make one from my hubby’s t-shirts. Thanks for sharing! Let me chime in here — those are my shirts that Jane transformed into the most amazing tote bags! I’ve been using them as knitting project bags. Perfection! This is an excellent tutorial! Thank you. I love this idea. I love that this bag uses a tshirt, but it isn’t the standard tshirt bag that uses the whole shirt with the sleeves cut off. The fabric & shirt coordination is beautiful! I’m already thinking of some shirts I’ve saved to do something like this with & I’m thinking I already have some pillowcases that would work instead of the fabric, just have to find some duck to match. Thanks! I love the colors and the sea hose! I have some cool embroidered design shirts that aren’t actually that comfortable to wear – this project could be the perfect thing for them! Back will be salad material though. Thank you could not think how to do it. Great idea for the tote! Can’t wait to try it along with the quilt I am about to start with the clothes of my sisters who I just lost a couple months ago.? ?